I got 2 awkward hugs today. Hey, they happen. The first was from the owner of The Little Gym’s family member. I think she was quite skeptical over why I would give a hug which I found very interesting because I hugged the other family member first and she was thrilled with it. Huh. The second was from a fireman! 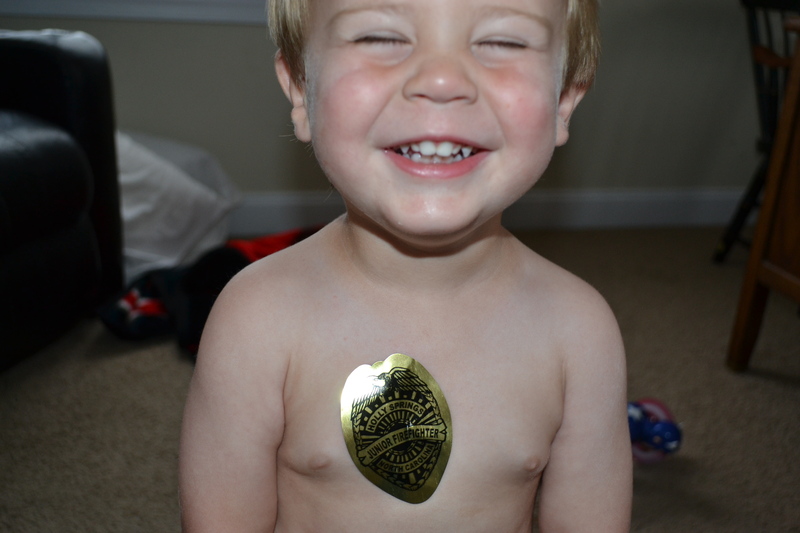 He was so sweet and brought Junior officer stickers to all of the karate kids. I loved the gesture so I stood up and asked him for a hug. He pulled away from me and gave me a very funny look. I smiled and said, “It’s ok. You don’t have to.” I saw the corner of his mouth start to tug upward like he wanted to smile but still wasn’t quite sure what to make of me and he said, “it’s ok.” So, I hugged him. He turned toward the other fireman he was with and I quickly made my way over where I received a much more accepted hug. Returning to my friends they kind of laughed at my slightly embarrassing moment and all I could do was shrug. Some people are just skeptical of the hug. It happens. But, it won’t keep me from hugging when 85-90% of the time the responses are awesome. Besides, just because it appeared unwanted doesn’t mean it was. Perhaps it was exactly what he needed. And, to top it all off the kids got rewarded with a quick flash of the firetruck lights as they waved goodbye out of the parking lot. Yup, totally worth the embarrassment.